Someones needing to have a word with him. ay what you will about its looks, the wing works. 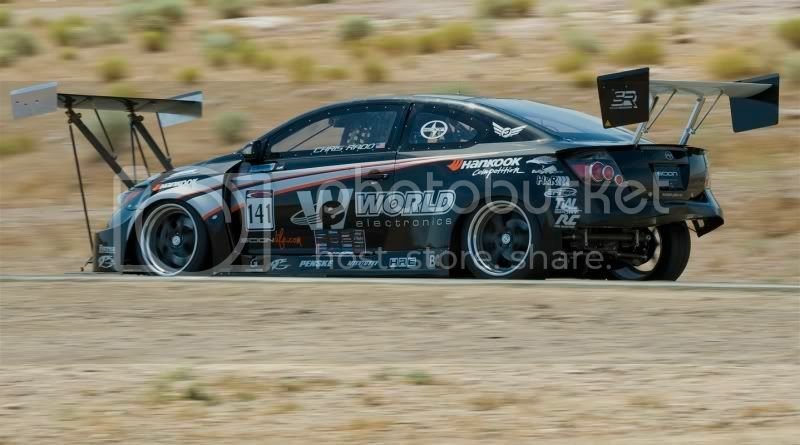 World Racing recently destroyed the competition at the Redline Time Attack race at Willow Springs International Motorsports Park in Rosamond, Calif. Chris Rado drove the supercharged Scion to a first-place finish in the Front Wheel Drive Unlimited Class. He posted a class-record lap time of 1:22.623 and even dusted some rear-wheel driver cars to take fifth overall. �Oh, the front wing, ha-ha, some people said it was crazy. Some people didn�t think we were serious, but the numbers speak for themselves,� World Racing said in a statement on its website. So Adam...can we expect to see something like that on the Skyline next year? Looks like Colin Chapman has come back to life. Poor chap must have difficulty seeing! You can see where the idea came from.